Our feline friends are lovely pets and are known for their independent nature. They love to play, cuddle, sit on cosy places, they like getting your attention and like to go pretty much wherever they want. Just as cats are adorable, they can be annoying at times when it comes to clawing your sofa or other furniture in the house. You may despise it but for a cat, it is a normal behaviour and a natural instinct. 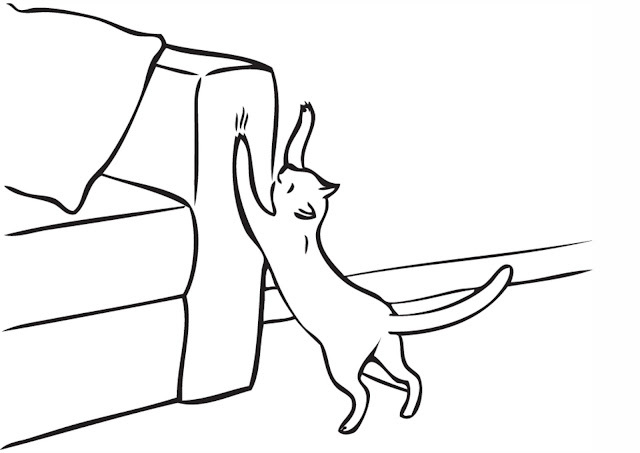 Before we go into what ways you can keep your cat off the furniture, you first need to know why they claw. Cats need to scratch and climb because they are highly enjoyable feline activities and are part of the essence of being a cat. Scratching conditions your cat’s claws by removing the old layers of the nails. It helps them to keep their claws sharp and healthy. 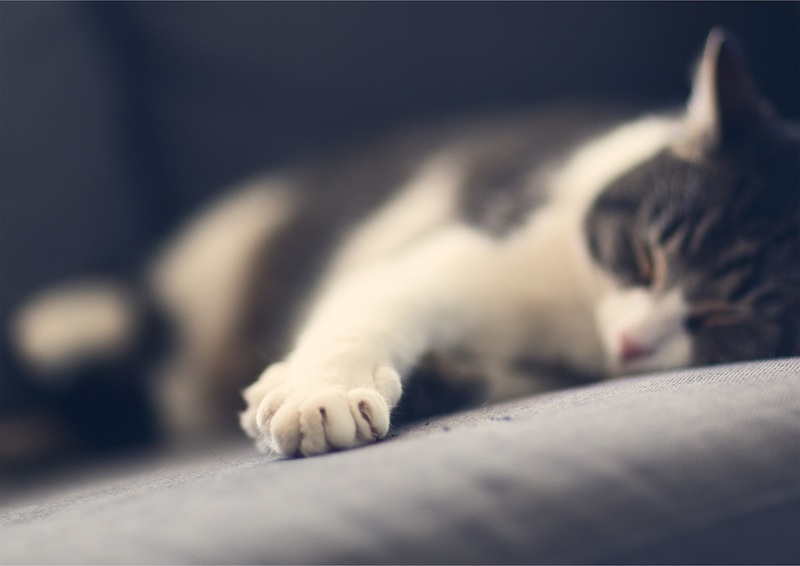 A cat’s paw will have scent glands and scratching releases scents on the furniture or carpet to communicate territory boundaries to other cats and animals. Even if you have only one cat at your home, she/he will feel the need to transmit information in this manner. When cats stretch, it provides exercise and loosens up leg and shoulder muscles and tendons in the cat's paws. Scratching makes the cat feel good. It relieves stress and decreases the possibility that your cat will develop other unwanted behaviours. Ways to prevent your cat from clawing your furniture. Since your cat will want to and need to scratch, provide your cat with alternatives so that she/he learns to alter her behaviour and scratch on harmless things like scratching post. Through classical conditional method, you can train the cat to scratch on the post instead of the sofa. Vinegar is a natural product, so you can add vinegar to a spray bottle and spray it near your sofa if you don’t want your cats to get on. The vinegar smell turns down a cat. Vinegar is a deterrent for cats and a deodorizer that cleans the air around your furniture. Spray water as soon as you see your cat on the sofa. Cats don’t like citric food. So keep citric fruits near the furniture. You might have spilt some coffee or food on your sofa and are not sure how to remove the stains. This blog will give you a complete guide on how to maintain your sofa the right way. Remember that maintenance is not only necessary but it’s the basic precaution you need to take. Once you give proper care and attention to your sofa, you can be sure it stays in top notch condition and is able to look after you for a very long time. • First and foremost maintaining the colour of your sofa is essential whether it is a fabric or leather. To meet this, it is best not to expose your sofa to direct sunlight or any heat source to avoid from fading or discolouration by all means. If it’s a leather sofa, too much sunlight can cause the leather to age and crack much faster by drying it out. Besides, direct sunlight is also the bitter enemy of your fabric sofa. Not maintaining it can result in fading, and weakening of fibres. So, place your sofa two feet away from any heat source including air conditioners and heater vents. • When re-arranging your furniture, do not lift your sofa by the cushions sewn to the frame or move your sofa by dragging it around. The best way is to lift it from the base. • Armrests and backrests are not designed for seating. They can withstand only the weight of your arm and not your body. Sitting on them may result in deteriorating in the well being of your sofa. • For even wear and to avoid forming wrinkles, crease or stretch marks, you should alternate your choice of seat. Following these basics will ensure the longevity of your sofa. Here are tips for maintaining leather and fabric sofas in detail. Leather furniture ages with style and grace. Owners can help keep their leather furniture looking rich and supple by cleaning the dust and dirt regularly. Doing this will help the leather look vibrant rather than dingy, and it will prevent dirt from being worked into the creases. Dust your leather sofa weekly using a vacuum cleaner, a soft brush or with a clean, dry and non-abrasive white cloth. A vacuum cleaner is a useful tool for maintaining leather furniture because it can reach crumbs and other debris hidden in tiny crevices. Dust the sofa thoroughly. Pay special attention to the spaces between the sofa's seat cushions. Doing this from time to time will dramatically increase the life span of your sofa. Sofa owners should be diligent about quickly cleaning any spills on their leather furniture or else the fluid will penetrate into the material and leave spots. So, blot the fluid as soon as possible. Do not wipe it though; it may spread the liquid and stain the surrounding area too. Dry stains can be removed by an extremely soft brush. To remove all kinds of other stains and spills, do not use strong detergent soaps, furniture polish, oils, varnish, abrasive cleaners, bleach and ammonia-based cleaners or harsh cleaners that can easily ruin your expensive sofa. Although leather is a durable material, it is porous in nature. Instead we recommend Leather Master, a water based solution that eliminates unwanted stains, protects and rejuvenates the leather to ensure it remains supple. Before using the solution, make sure you test it on an inconspicuous spot than on the entire sofa. Use it by dabbing a small amount of the product on the leather, and you can see the effects without being apprehensive. Blot the surface by dabbing the solution carefully with a paper towel, do not press hard as this could push the stain into the pores of the leather. If you are using this product additional treatments for stains are not required. Keep your leather furniture covered with light weight sheets when not in use, so that it won’t need to be dusted or vacuumed as often. This will also prevent unwanted spills and keep sunlight off the furniture, which can dry out and crack the leather over time. 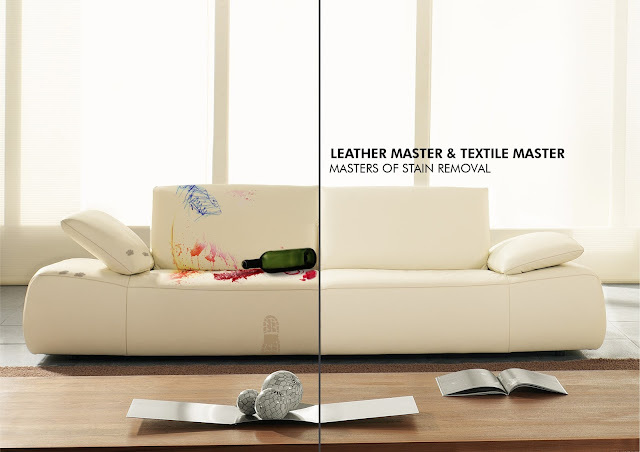 Owners who would like to begin maintaining their leather furniture can start by collecting all the necessary tools. You can ask your sofa manufacturer or the sofa store from where you purchased to suggest you the cleaning products. While cleaning it is recommended to start from the outside of the stain towards the centre and to clean entire panels of your sofa rather than undertaking spot cleaning. While doing these, ensure that the leather is not wet and the solution dries naturally. After the leather is clean and dry, it should be protected and moisturised to replenish any oils that were lost over time or removed during the cleaning process. Also while cleaning your furniture, you can check for the tags attached to your furniture, these generally provide information tips on cleaning. Read these closely, as they will advise on the right kinds of products to buy and the right method to use. If your sofa has removable covers, you may even be able to zip them off and either machine-wash or dry-clean them. Cleaning your leather sofa regularly will help the leather breathe and last longer. If maintained with proper and consistent care your leather will look great every year and age to perfection. Though it’s known for its durability and opulence, maintenance shouldn’t be underestimated but an inevitable part of your sofa. To maintain your fabric sofa, you need to vacuum regularly with an upholstery attachment, using low suction to remove dust that has settled on your upholstery. Leaving the dust unattended may result in penetrating into the fibers, acting like sandpaper, causing the material to wear out much more quickly. Remove all the cushions and clear away anything that’s fallen in between. Now use your vacuum to clear away any dust and surface dirt from your sofa. Use the specialist vacuum attachments to get inside the crevices, and ideally use the soft brush attachment to be as gentle possible on your sofa’s upholstery. Work in a systematic grid across the entire surface of the sofa to ensure you don’t miss a spot. If your sofa has removable covers, you may even be able to zip them off and either machine-wash or dry-clean them. If your sofa covers aren’t removable, one method of cleaning them is to use a steam cleaner to deep-clean your sofa and its cushions. Make sure to let everything dry completely before you put the cushions back on the sofa. Just be sure to consult the manufacturer’s manual to check this is a suitable method for the type of fabric. Dry cleaning is recommended every 6 months to help remove dirt and soiling and to maintain the look of your sofa. Do spot cleaning wherever necessary. Pre-test the cleaning method on a hidden area of the sofa. Do not continue if there is an adverse reaction such as discolouration. Apply the solution gently with a clean, damp cloth. Use a stiff-bristled brush to break up the spots and vacuum up the released dirt. 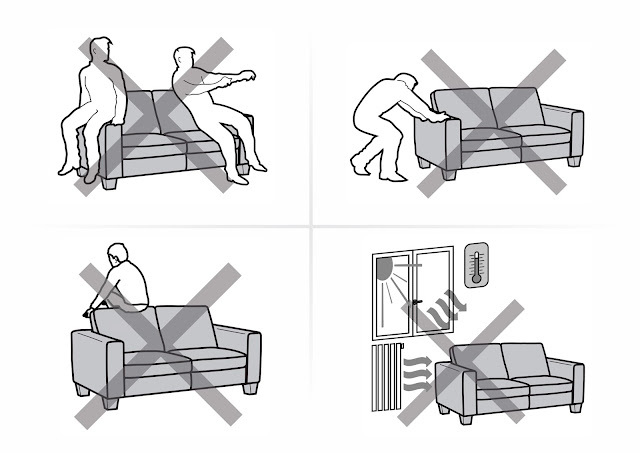 Do not get the sofa over saturated, and do not rub the stain as this may make it more difficult to remove. Rinse the area by using another clean, damp cloth, and then let it dry naturally. Avoid over-wetting as this may result in a water mark. Blot the cleaned area with a clean cloth to help dry the area. Allow the fabric to dry in a well ventilated area. Do not spray spotter directly onto fabric. Stubborn stains may require a second and third application. Allow the area to dry between attempts. But if your sofa has cushions that are all the same size and shape, the center one can be regularly rotated to the ends, greatly extending your cushion life. Clean spills or marks immediately, as stains are harder to remove when they are left unattended. Use Fabric Cleaner on spills and marks, as general household cleaners can damage fibres and discolour fabrics. Always refer to your fabric care label attached to your sofa. Preserve the furniture tag as it contains some useful information about the upholstery including care and maintenance. Make sure you read the directions and guidelines before cleaning your sofa. Prevent sharp objects such as rings or buckles from coming into contact with your furniture, as they may cause pulling or tearing of fabric. Organise an annual professional clean by upholstery cleaner to maintain your sofa's condition. These tips will make it easy to clean your sofa and rejuvenate its look, in turn an inviting look to your family and guests. These do-it-yourself tips on maintaining your leather and fabric upholstery are easy and ensure that your sofa looks best and retains its value. In some rare circumstances, if you really feel you cannot get those spots out of your upholstery then it’s advised to have them cleaned by a professional rather than ruining the material with experimental methods. That being said, these tips are not only applied to sofas but also to chairs, recliners, sofa beds, armchairs, sectional sofas, home theatre seating and the like depending on the material. At the end of it, whether yours is leather or a fabric, you want to make sure that your favourite furniture is rich in colour, look and feel so that your guests can have an enjoyable time. And that maintaining is a great investment not only for its longevity but also as a means of perking up your décor. To know more about what sofa care and maintenance, click here. Though glass tables have been around for a long time, some people are still reluctant to buy them because they believe that glass breaks easily and is hard to maintain. Yet, they know not about the fact that modern technologies in furniture manufacturing have developed so rapidly that all the above statements are now myths. Modern glass tables come in tempered and other types that are robust and resilient so much that they can withstand heat and scratches. One of the greatest benefits of glass tables is that they can be bent or moulded to any size and shape thus making them more flexible than other material tops. 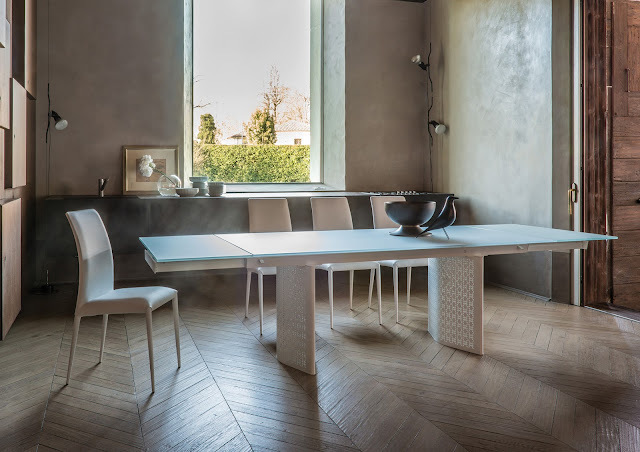 Venezia: This plush dining table by Tonin Casa has a base that reflects the ancient Venetian know-how. Along with its ornate design, the glass top adds a grounded presence to your living room. Greeny: This dining table expresses the harmony of natural elements. 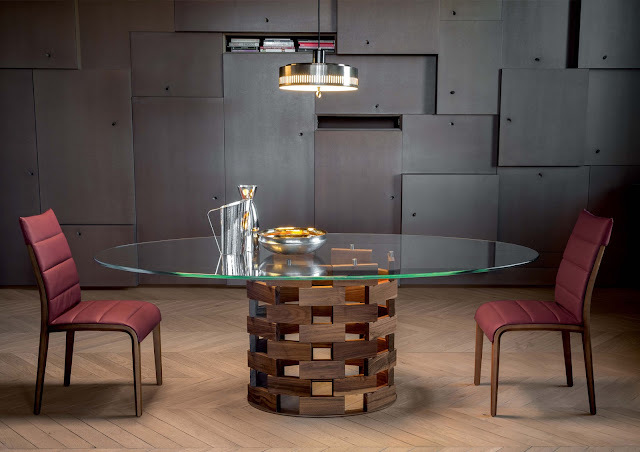 An oval shape glass table by Bonaldo, it pleasantly reveals personality synonymous to its name. 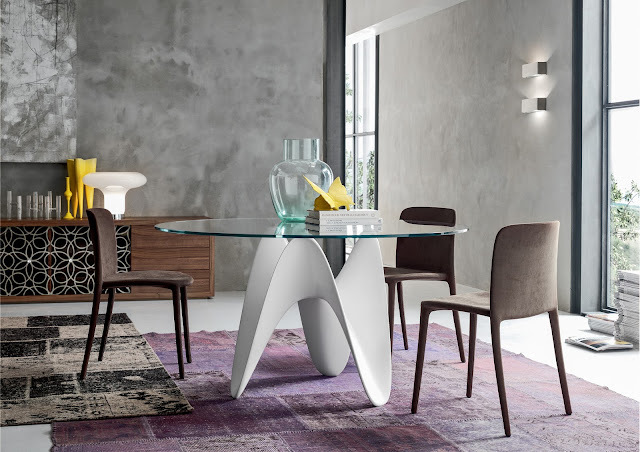 Gaya: Simple and balanced, this fixed glass table by Tonin Casa has a Tecnoril base made of a new generation acrylic stone that guarantees high resistance and superior quality. The glass elegance and refinement of new materials make it perfect for homes with contemporary taste. Arpa: This fixed glass table with an aluminium track, glass top and unique base goes against all conventional designs. It gives an optical illusion from the front. 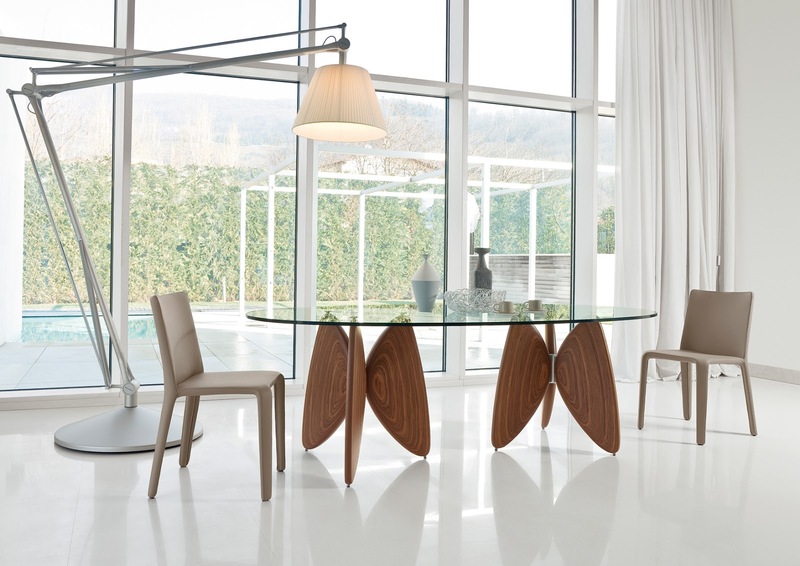 Butterfly: The glass table is supported by thermal bent plywood made to look like its name butterfly. 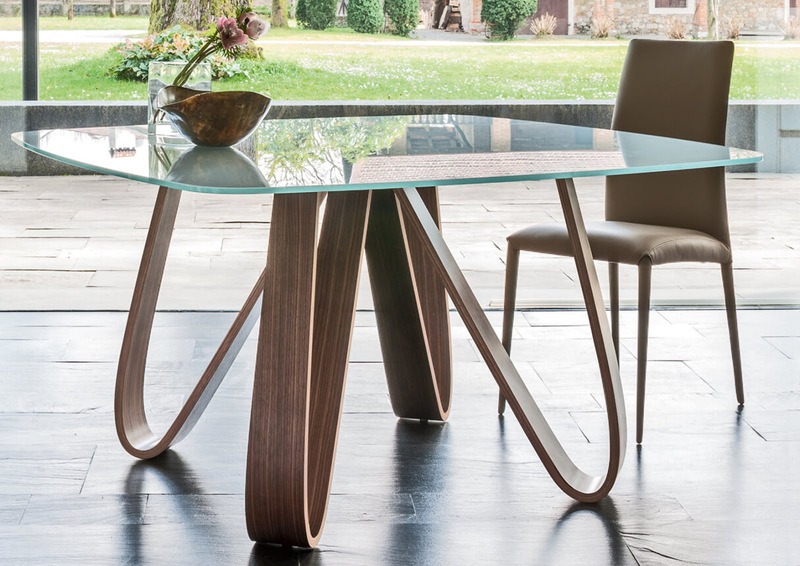 While elegantly merging wood and glass it gives the table an attractive look. The audacious design blends with the classicality of glass to uncover a table with an inimitable design. Eliseo: The Round Dining Table exhibits a minimalistic design that can be paired with a variety of seating styles to complete your modern space. This fixed table in tempered glass top has base in curved and lacquered metal that defines higher quality and refined beauty. Tokyo: Fixed glass table with a base in agglomerate marble that features a stunning design in an X shape. This contemporary and chic dining table by Tonin Casa is sure to be an ideal focal point in your modern living room. Minimalist in design, this table has an ability to blend into your already established modern home decor while still exuding beauty and sophistication with a timeless design. 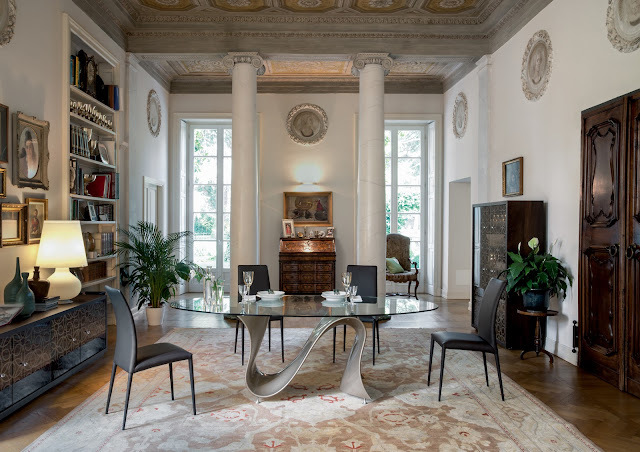 Wave: A true symbol of contemporary furniture design, the Wave dining table by Tonin Casa presents a spectacular amalgamation of high quality manufacturing and extraordinary detail. This modern and refined glass table has a sinuous and solid base made of Baydur that recalls a wave. This table brings to into the dining room a passion to welcome and the vocation for a refined elegance. 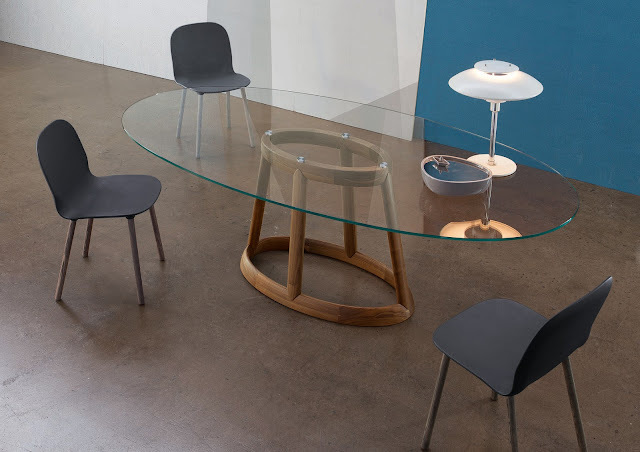 Tokyo: The round tempered glass top rests on an extremely attractive rounded frame, made of solid wood, with splayed legs joined by a metal insert. It takes its names from the forward thinking Japanese metropolis, Tokyo combines a sleek glass top and swooping formed frame to create a striking modern profile. 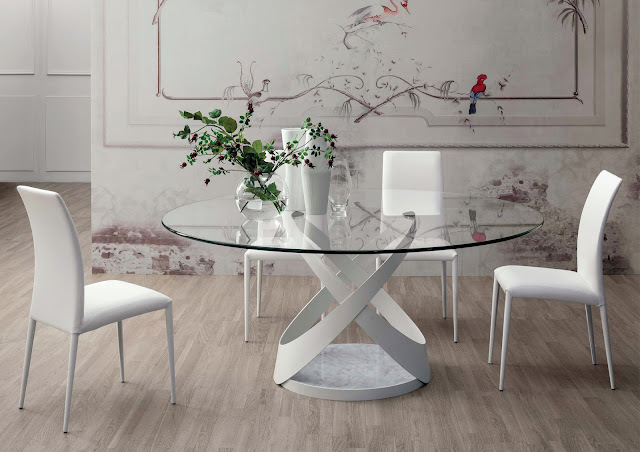 Elegant and airy, this table is by Calligaris. It has a slender design that is perfect for contemporary kitchens and dining spaces. Its smooth glass surface allowing the beautiful walnut frame to shine through. Orbital: Glass table cannot be extended is now a myth. Calligaris Orbital dining table has a pedestal base and elliptical tempered glass top with an automatic extending system. Thanks to one fluid movement of its metal arms, the two extension leaves slide out from underneath the glass top and simultaneously position themselves at the same level, maintaining the table's elliptical shape. A locking device prevents accidental closure. It is a high-tech, design savvy extending table, a scenic presence in your domestic ensemble, the true protagonist of your dining room. 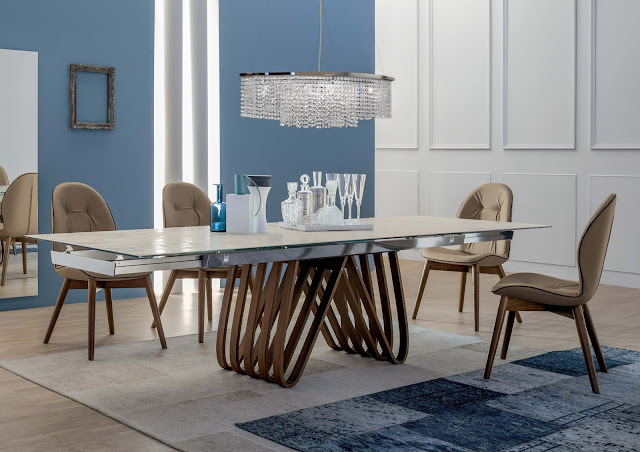 Mille: The beautiful dining table by Bonaldo breaks all the conventional style of four legged table to a cluster of chromed legs grouped together that are bonded to the glass top. According to the designer Bartoli Design, the base provides maximum stability and is designed to look like trees in a forest. The fixed table has all the harmony and dynamism of a transparent body in motion. More than any other top, glass gives visual consistency from every angle. Vanessa: A sculpture dedicated to everyday activities, an object capable of adding intensity to the domestic setting, that's what Vanessa dining table is all about. The multi layered walnut sculpted legs and transparent glass top combine to create a functional yet beautiful piece of furniture. The base is designed to reflect the wings of a butterfly. This striking table by Bonaldo is ideal for any contemporary setting. Capri: This fixed table by Tonin Casa tells an all-Italian story with its structure and design. The metal base holds the transparent glass top like two crisscrossing bands of energy, and is balanced by a polished marble at the table's foot. This table blends metal, glass and refined marble to form a perfect beauty that stands out in classical yet modern setting. 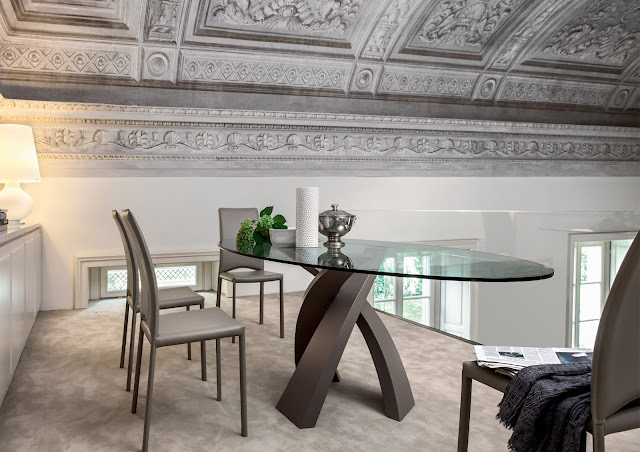 Colosseo: This fixed table by Tonin Casa was inspired and got its name from the Colosseum monument. The base has wood blocks combined to make it look like the monument and the glass top valourises your dining room making it the perfect furnishing with a touch of style and personality. 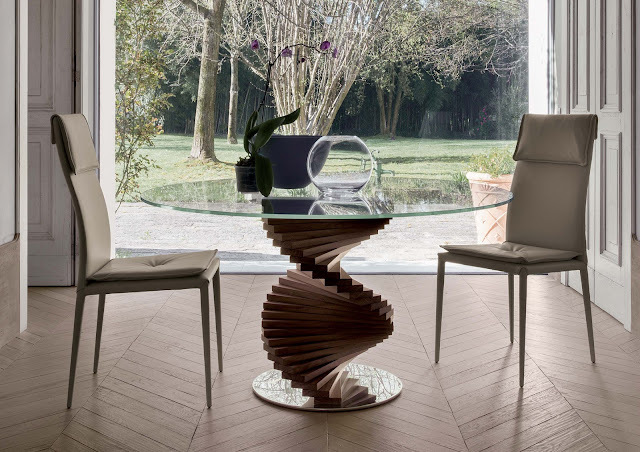 Firenze: An original and elegant design, this fixed table has a glass top with a base of wood strips combined to form a spiral sculpture or helix. 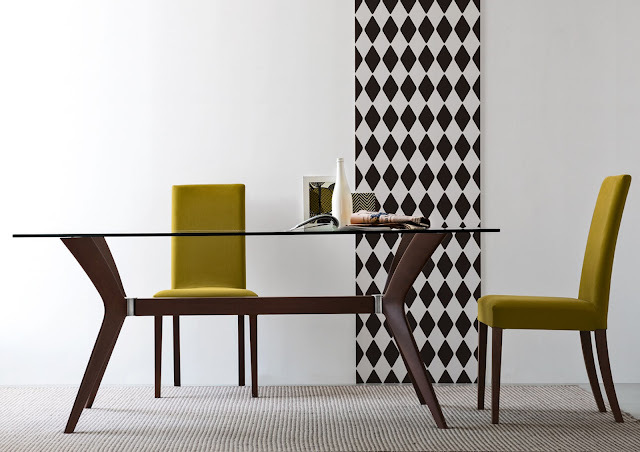 The table by Tonin Casa is named after the birthplace of the Renaissance, Florence. Firenze combines precision, warmth, sobriety and inventiveness to stand out in your dining setting.